Tires are often overlooked, but wildly important in the safety and security of your next bike ride. Learning how to inflate your bike tires properly, review their condition, and fix flat tires is something every rider should know. The first thing about tire care is proper air pressure. Having too much air will result in a rough ride, while too little leaves you susceptible to pinch flats and poor control. 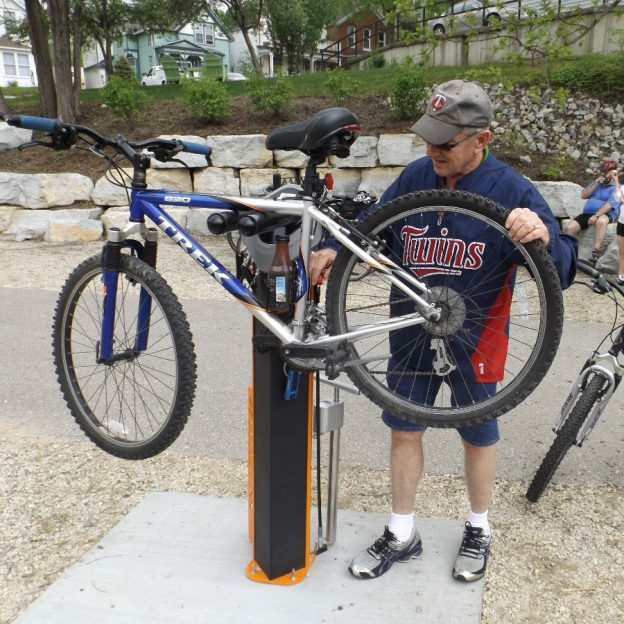 The best way to inflate your tires is with a bike pump. 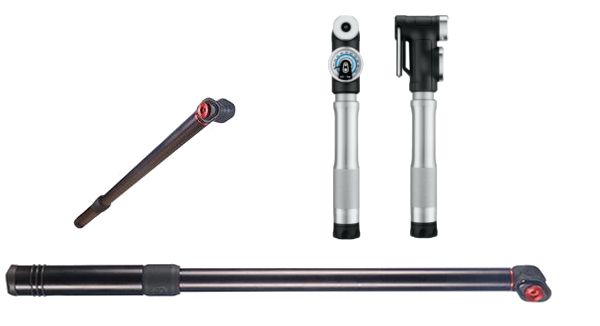 To use a bike pump, it’s important to understand how the bicycle tire valves work, and what pump options exist. Bike pumps are great because they typically work on both type of valves. If you aren’t aware, there are two commonly used valves. The American (or Schrader) valve is the most common. It’s the same valve used on car tires. It has a spring-loaded valve, that self-seals. 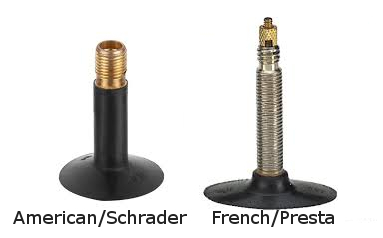 The other common valve is a French (or Presta) valve. A Presta valve is narrower than an American valve and uses the pressure inside the tube to seal itself. It also has a lock barrel on the end of the valve to secure it shut. With the American valve, inflation is as easy as taking off the valve cap, attaching the pump and inflating. In Contrast, the French valve adds a step. First remove the valve cap, loosen the lock nut, then attach the pump and inflate. 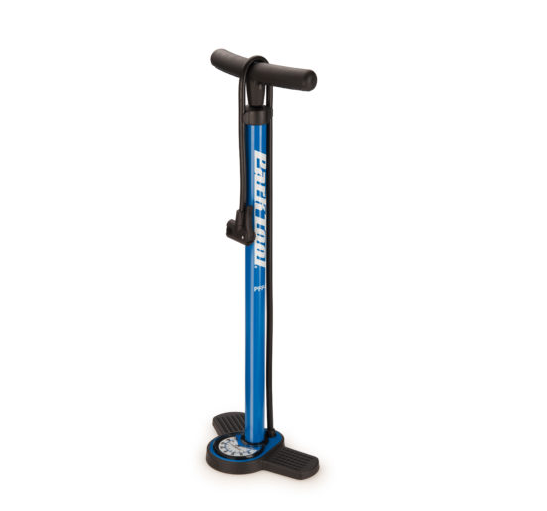 The most economical and portable type of bike pump is a hand pump. Hand pumps vary in size from just a few inches long to almost two feet. They won’t fill a tire to pressure quickly, but for emergency repairs, they do a great job. Floor pumps are by far the best option to inflate your bike tires. They are usually around 3 feet tall, work on both valves, and have a gauge that displays the tire’s pressure. While not portable, they are the quickest way to fill a tire. 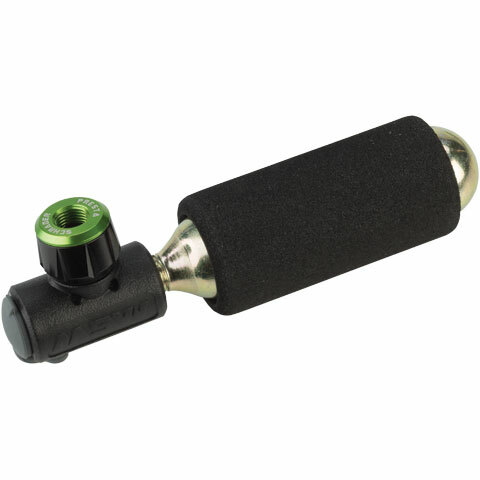 Inflators use small cartridges usually filled with CO2 gas to quickly bring your tires up to pressure. They are great for emergency repairs, but at $2-3 per cartridge, they are too expensive for everyday use. Before you inflate your tires, review their condition. There are a major concerns to be aware of like dry rot, tread wear, and sidewall wear. 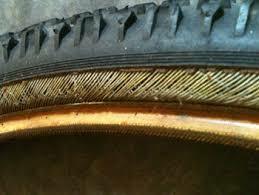 All tires are susceptible to dry rot. Dry rot is when rubber hardens, and cracks. It is caused by exposure to UV rays, O-Zone and Oxygen. As the bike tires age, they lose elasticity, durability, and traction. Typical signs that a tire is dry rotted is discoloration, meaning a normally black tire will appear grey. Additionally, you will notice small cracking on the tread to begin, and large cracking at later stages. 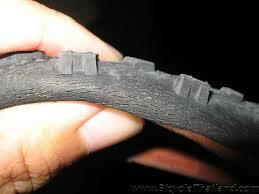 Bike tires are built out of rubber impregnated fabrics. The rubber gives the tire durability, and the fabric allows the tire to conform over objects. Pay close attention to the sides of your tire for damage or “threading”. Damage would look like cuts, or punctures, while “threading” is when you see the rubber and thread separating, resulting in loose threads coming off the side of the tire. The tire’s life is over when no more tread is left. On road tires, you can frequently see a difference in color once you wear through the tread. Mountain tires are a bit more difficult to call. For off road use, a tire stops functioning well once the tread wears down. This doesn’t meant he tire needs to be replaced for threat of flats, but t will stop functioning properly where traction is concerned. What pressure should I run? Tire pressure is usually called out on the sidewall of the tires somewhere. What you will see is a pressure range like 50-70psi. Follow those recommendations for best wear and ride quality. This entry was posted in News and tagged #FindYourNextAdventure, #mountainbiking, #nextadventure, #ridemybicycle, Bike Guide Minnesota, Bike tires, CO2, Dry Rot, Filling bike tires, Floor Pumps, Hand Pumps, how to, Tire Inflation, Tread Wear, Valves on May 17, 2017 by John Brown. Can you offer any idea on the distance a road bike tire should be able to go before needing replacement? Thanks. Tire Life is somewhat dependent on both the brand of the tire and the conditions you are riding in. A safe estimate would be 2000 miles on average.